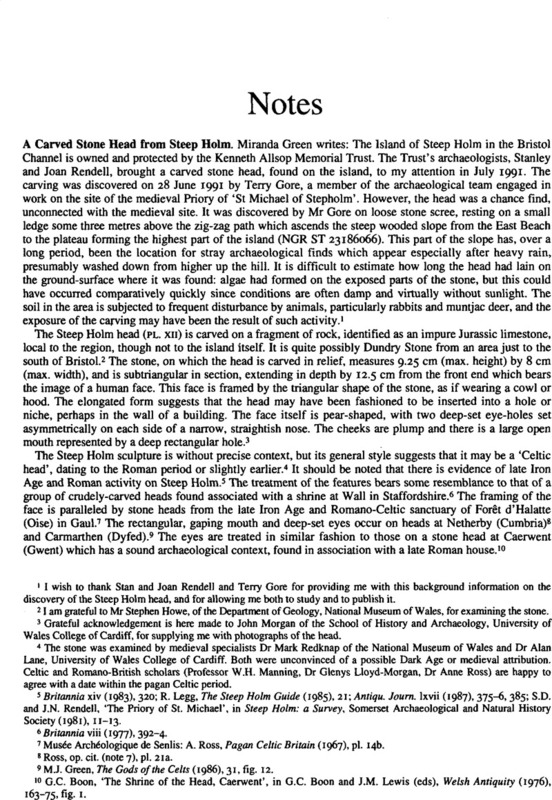 1 I wish to thank Stan and Joan Rendell and Terry Gore for providing me with this background information on the discovery of the Steep Holm head, and for allowing me both to study and to publish it. 2 I am grateful to Mr Stephen Howe, of the Department of Geology, National Museum of Wales, for examining the stone. 3 Grateful acknowledgement is here made to John Morgan of the School of History and Archaeology, University of Wales College of Cardiff, for supplying me with photographs of the head. 4 The stone was examined by medieval specialists Dr Mark Redknap of the National Museum of Wales and Dr Alan Lane, University of Wales College of Cardiff. Both were unconvinced of a possible Dark Age or medieval attribution. Celtic and Romano-British scholars (Professor W.H. Manning, Dr Glenys Lloyd-Morgan, Dr Anne Ross) are happy to agree with a date within the pagan Celtic period. 5 Britannia xiv (1983), 320; R. Legg, The Steep Holm Guide (1985), 21; Antiqu. Journ. lxvii (1987), 375–6, 385; S.D., and Rendell, J.N., ‘The Priory of St. Michael’, in Steep Holm: a Survey, Somerset Archaeological and Natural History Society (1981), 11–13. 6 Britannia viii (1977), 392–4. 7 Musée Archéologique de Senlis: A. Ross, Pagan Celtic Britain (1967), pl. 14b. 8 Ross, op. cit. (note 7), pl. 21a. 9 M.J. Green, The Gods of the Celts (1986), 31, fig. 12. 10 G.C. Boon, ‘The Shrine of the Head, Caerwent’, in G.C. Boon and J.M. Lewis (eds), Welsh Antiquity (1976), 163–75, fig. I. 11 Livy X. 26; XXIII. 24; Diodorus Siculus v. 29,4; Strabo iv. 4,5. 12 F. Benoit, L'Art primitif meditérranéen dans la Vallée du Rhône (1955). 13 R. and V. Megaw, Celtic An (1989), ill. 83. 14 Savory, H.N., Guide Catalogue of the Early Iron Age Collections, National Museum of Wales (1976), pl. IIIA. 15 Ross, op. cit. (note 7), 61–126. 16 W.J. Wedlake, Excavations at Camerton, Somerset (1958), pl. xvi. 17 Ross, A., ‘A Celtic three-faced head from Wiltshire’, Antiquity xli (1967), 53–6. 18 M.J. Green, Dictionary of Celtic Myth and Legend (1992), 18–21. 19 P. MacCana, Celtic Mythology (1983), 97–8. 20 G. and T. Jones, The Mabinogion (1976), 37–40. 21 Green, M.J., ‘Celtic symbolism at Roman Caerleon’, Bull. Board Celtic Studies xxxi (1984), 251–8.